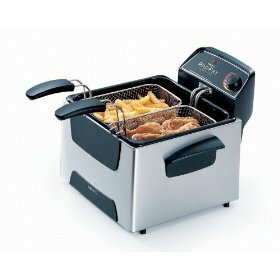 The Presto Dual ProFry Deep Fryer has two baskets, allowing you to fry two different foods at the same time. Imagine frying fries and corn dogs at the same time! The baskets hold a generous 12 cups of food for frying. This deep fat fryer can handle cooking for a crowd. The rectangular baskets work well for large pieces of fish or chicken. The thermostat is adjustable, letting you select a variety of frying temperatures. An indicator light lets you know when the oil is ready. A powerful 1800 watt immersion element heats the oil efficiently, allowing the oil to recover optimum temperature quickly. The cover makes an excellent spatter shield, protecting your surrounding area from hot oil. It fits nicely on the counter. The stainless steel exterior looks nice and cleans up easily. The Presto Dual ProFry Deep Fryer looks nice on your kitchen counter with its shiny stainless steel exterior. Being able to cook more than one item at a time is a great time saver. It cleans up easily. You can put the element, the oil pan, the lid and the baskets all in the dishwasher or wash them by hand. The lid makes it possible to raise and lower the baskets while the lid is on the fryer. It is priced very reasonably for such a large fryer. The vat holds a gallon of oil. This fryer can be used for chicken, fries, fish, onion rings, zucchini, tortilla chips or anything else you may need crispy. Foods with wet batters can be fried perfectly by lowering the baskets while they are empty and then using tongs to put the food in the oil. The Presto Dual ProFry Deep Fryer has had some issues with temperature accuracy. You may want to double check the temperature with an independent cooking thermometer. Some consumers have found that stirring the oil helps it get to temperature. If the oil doesn't reach the desired temperature, the food soaks up too much oil during cooking, leaving it greasy. The electrical cord is only two feet long, so make sure you have an outlet nearby. Some consumers have had oil spatter even with the lid on. Emptying the oil vat is awkward, even after the oil has cooled. The edges of the vat are sharp. The Presto Dual ProFry Deep Fryer has enough room to cook for several people. It has even been used in small commercial ventures. It allows you to cook a lot of the same food or two different types of food at the same time. The vat holds a large quantity of oil. The temperature may need to be watched. Reports of oil not getting hot enough or too hot have occasionally come in. Most people have found it easy to adjust. Others have found it better to take the fryer back. Clean up is easy. A quick wipe down on the outside is all that is needed for the chassis. Used oil can be filtered and stored for further use or disposed of. The cord is really short, which can be a problem if you don't have a lot of accessible outlets where you want to fry. Get this deep fat fryer at Amazon for 36% off.